Is quite easy to insert the (−OH) function in a molecule, but is surely more difficult to convert alcohols in other compounds, with different functional groups. For example the reaction beside doesn't take place, whatever is the nucleophile used. This because OH- is a really bad leaving group (an empiric rule suggests that the stronger is the conjugated acid of the leaving group the better is the leaving group itself). This particular reaction has a good yield just because goes through a tertiary carbocation , therefore a carbocation surrounded by three methyl groups, so particularly stabilized by close σ-bonds. Formally, te reaction is a nucleophilic substitution kind SN1. If we use strong acid as HCl or H2SO4 we definetely can't hope that their conjugated bases (Cl-,HSO4-) act as nucleophiles giving us the substitution product. In fact they are very weak bases, ions almost inert. This carbocation gives preferentially the elimination product, because this reaction takes place much more quickly (is intramolecular) than the intermolecular reaction, which involves the approaching of the nucleophile (Br-). This kind of reactions are governed by the average life time of the intermediate species. In cases like this, where is not long enough, the intramolecular reaction prevails. Another issue linked with the use of strong inorganic acid to have a nucleophilic substitution is the bond to employ the counter ion as nucleophile. I.E. if I use HCl as acid, i can count only on Cl- for the substitution. If I added a stronger nucleophile this would be a strong base as well, but this imply that would be istantly protonated by the acid (that we've besides to use in relatively great quantities to transform −OH in a good leaving group). For example, if we added ammonia, this wouldn't operate the nucleophlic substitution on the carbocation, but on the contrary would be protonated to give ammonium ion NH4+. - work on a stabilized carbocation (either tertiary or delocalized → stability of carbocations). - use for the substitution an hydrohalic acid. To avoid various issues linked someway to the acid environment ad hoc reactives can be used to insert specific functional groups on a molecule. This kind of reactions too involve the transformation of the hydroxyl group in a bettere leaving group. The most common methods imply the use either of PBr3 and SOCl2 to insert halogens, or tosylate (p-toluene sulfonyl chloride) to allow the insertion of whatever nuclophile. 2) The reaction operating with thionyl chloride SOCl2 is extremely similar and allows to replace the hydroxyl function −OH with an halogen Cl. There's just one difference, consists in the fact that the nucleophile (Cl-) attacks "from the inside". 3) The tosylate based reaction is similar as well but results in a structure that is susceptible to be attacked by different nucleophiles. 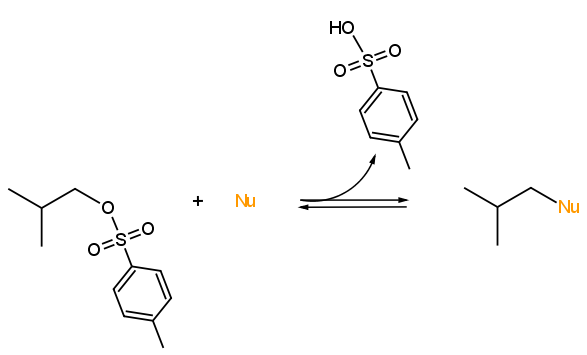 In the end, the method probably more interesting to practice an SN2 nucleophilic substitution on alcohols is the Mitsunobu reaction, described specifically in another article.